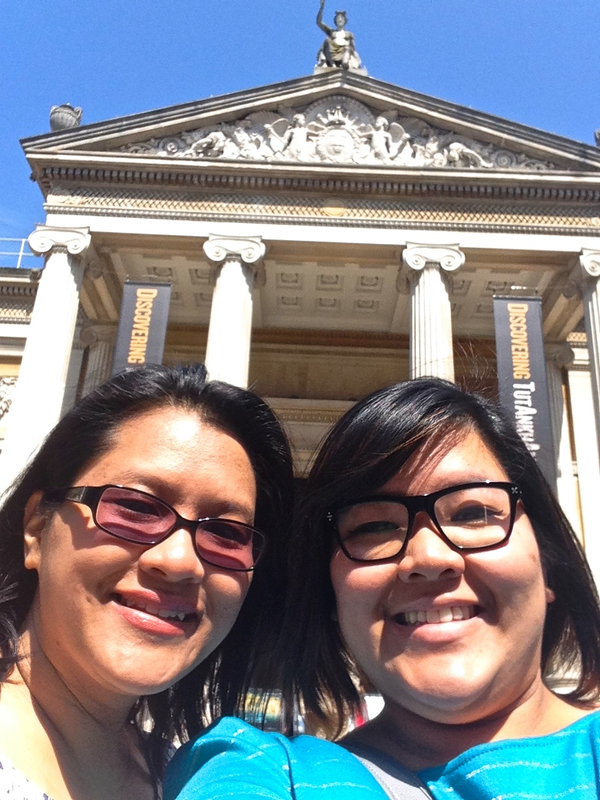 England 2014: Day 4 – Hello, Oxford! On Wednesday morning, July 30th, we bid adieu to Bath, our home for the past 3 days and 3 nights. 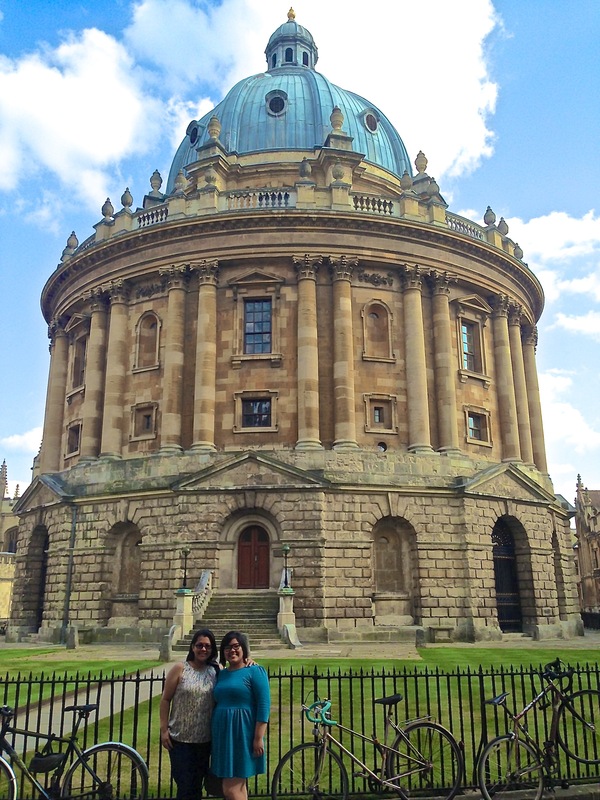 The next leg of our England adventure took us to Oxford. This day would prove to be an epic whirlwind, as we dropped in, spent the day, and zipped right back out again! Fortunately, it was yet another amazing day. As you can probably imagine, there were several moments during this day that moved me to absolute tears; I was absolutely overwhelmed by the amount of history and creative energy that surrounded us here. J.R.R. 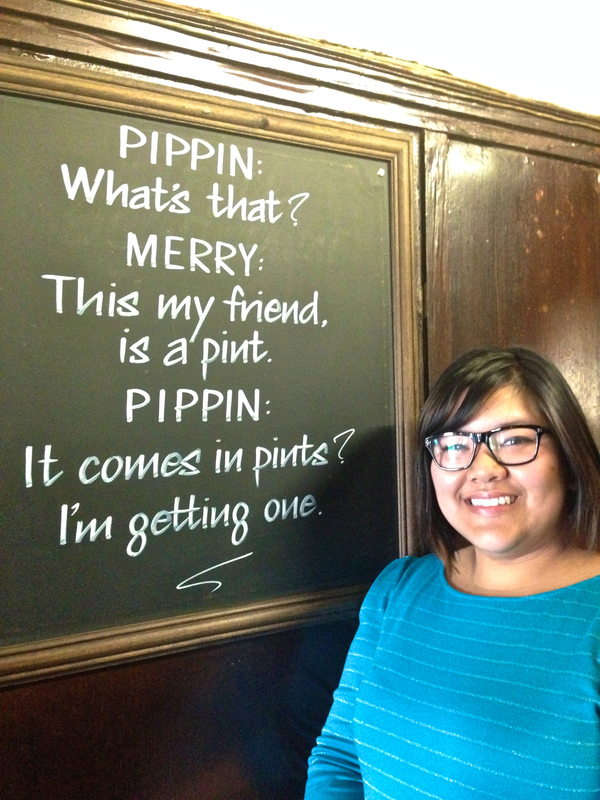 Tolkien is one of my life heroes, and on July 30th, 2014, I was able to walk in his footsteps for a day. The travel was relatively painless! Hauling luggage up and into trains was a challenge at times, but I quickly found that there were always people willing to help. Whether that was genuine kindness or more get on with it so we can get on the train too, I’ll never know…but I thank them all the same. Now, since we were only spending the day in Oxford, we had to find a place to stow our luggage (the rail station unfortunately does not have a Left Luggage area). Upon research, I found that the Oxford Backpackers Hostel will store luggage for you all day (£4 per piece) – a small price to pay if you want to tour a cobblestoned city by foot all day! It’s conveniently located on your way into the city from the rail station. There’s one thing you should take note of, however – the entrance to the hostel is on the ground floor, but the main area itself is on the second floor. Look at their gallery and see photo #3 – if you have large luggage, keep in mind that you’ll have to haul it up that set of stairs, and back down when you’re done. We learned that the hard way (and thankfully, one of their staff helped us)! With our luggage stored and our hands free, the sestra and I took a few minutes to orient ourselves with the city – it’s amazing how everywhere you turn, you’re essentially looking at a college. The University, as you likely know, is not one campus as most tend to be, but rather 38 constituent colleges which comprise the University as a whole. Our guide (whom I’ll be introducing shortly) explained it best: each college is like a province of Canada, with its own provincial government, but they come together to form the university (like our provinces form a country), ruled by a federal government. 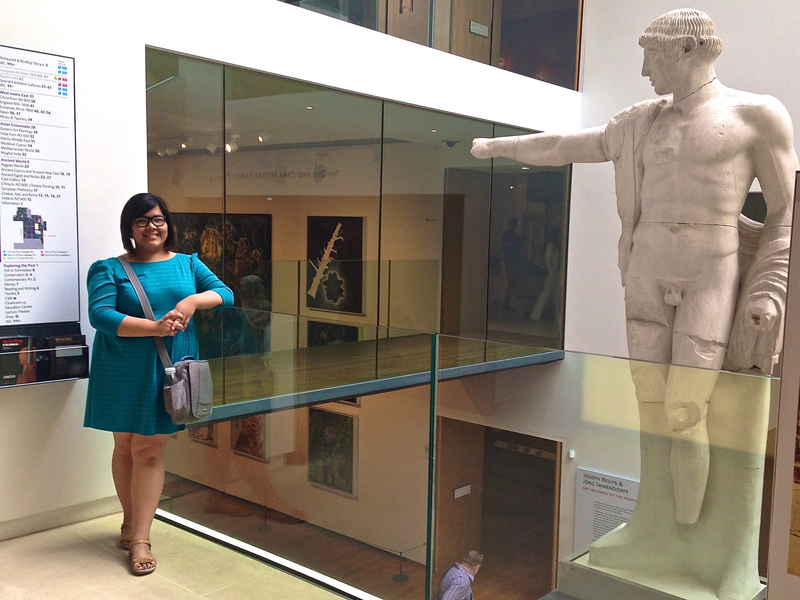 Before lunch, we had the opportunity to briefly explore the Ashmolean Museum. Though we barely scratched the surface here, it was still brilliant to walk through the exhibitions and see displays that academics have been poring over for years. From here, we trekked to our lunch stop, The Eagle & Child. 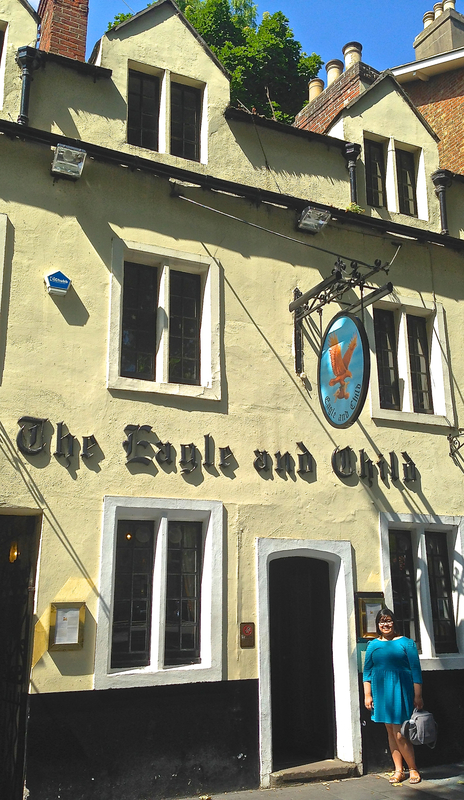 Known affectionately as The Bird & Baby or, unnecessarliy, The Fowl & Foetus, this pub dates back to the 17th Century, and is most known today as the regular meeting place of The Inklings, a literary discussion group whose most notable members are J.R.R. Tolkien and C.S. Lewis. Here at the pub, they met weekly for years, discussing fiction and even doing readings or showing each other some drafts! Imagine – just imagine! – the earliest pages of The Lion, the Witch, and the Wardrobe, or drafts of The Hobbit and The Lord of the Rings, being read here where I was sitting! It absolutely fascinates me, given how cramped these spaces are, that these pubs – the heart of a town, buzzing with life – would be filled to the brim with academics and cads alike, drinking pints, singing bawdy songs, exchanging ideas and writing some of the most famous books of all time. 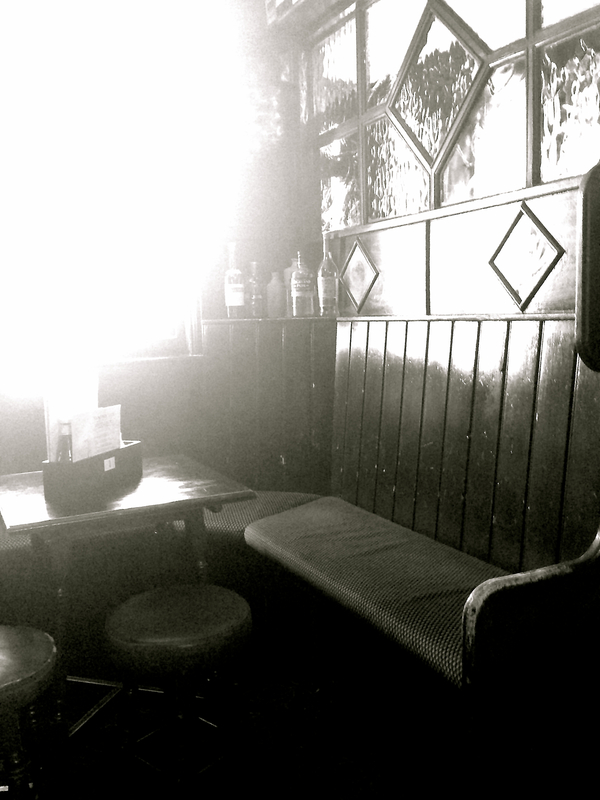 I sat at our small, creaky table on a cushion likely older than I am, and I found myself looking at the empty seats nearby, trying to will a spectre into being. The space had that kind of feeling – not foreboding in the least, but just that every wall, window pane, and wood panel was imbued with creative spirit and history. It was such a gift to be there. For lunch, we thought it appropriate to order proper pub food – nothing too pristine or fancy, and the menu had a lot to choose from! For lunch, they had a deal where you could pick one of six (or eight, it escapes me) meal choices and pair it with a beverage (non-alc or cider/beer on tap) for dirt cheap! My sister had some delectable Macaroni Cheese and discovered the wonders of Appletiser. 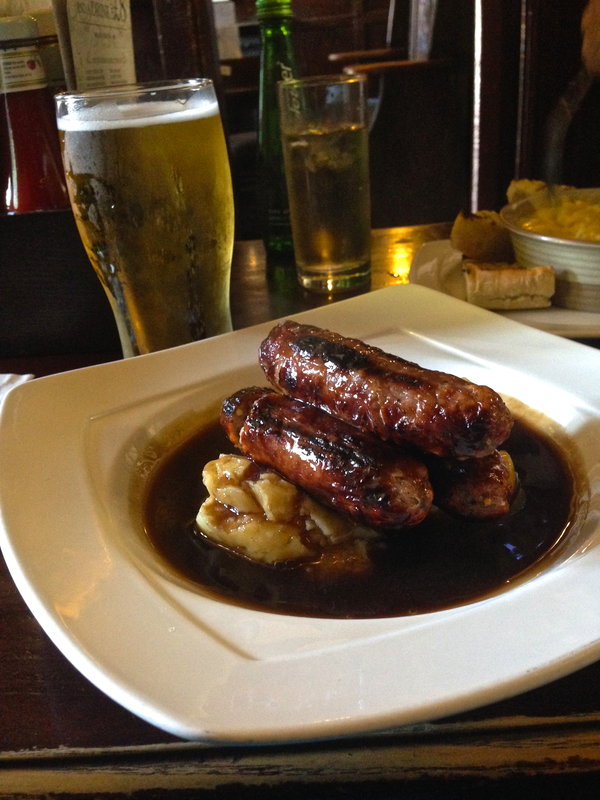 I, on the other hand, partook in an ice cold cider along with the world-known pub classic, Bangers & Mash. I can tell you right now that these were some of the best I’ve ever had. Gloucester Old Spot sausages, mashed potatoes that weren’t velvety smooth (which is exactly what you want at a pub, honestly. Not perfect pomme purée). And the gravy. The gravy. It was so good my sister had to tip some of it into her macaroni cheese and stir it in! I could easily, easily have that entire meal again right this moment, and would gladly accept it if someone knocked on my door with it right now. The flavours here just screamed comfort food and it was the perfect nourishing midday meal that would fuel us for the rest of the day. And boy, oh boy, with all that walking, did we ever need it. After lunch, we excited waited for our guide, David Gunnell, to arrive. David is the man behind Oxford City Walk, a company which specializes in private, bespoke tours of the city. 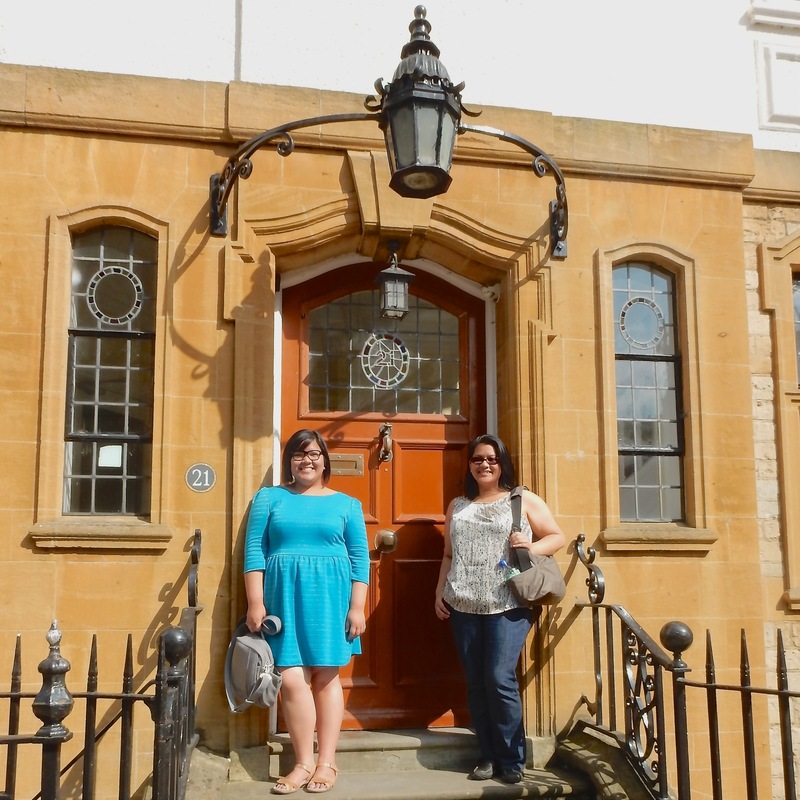 Like the other tours I’d done in the days previous, I found OCW after some TripAdvisor research and found that their prices – starting at £25/hour for a group of up to 5 – is absolutely, completely worth pursuing! 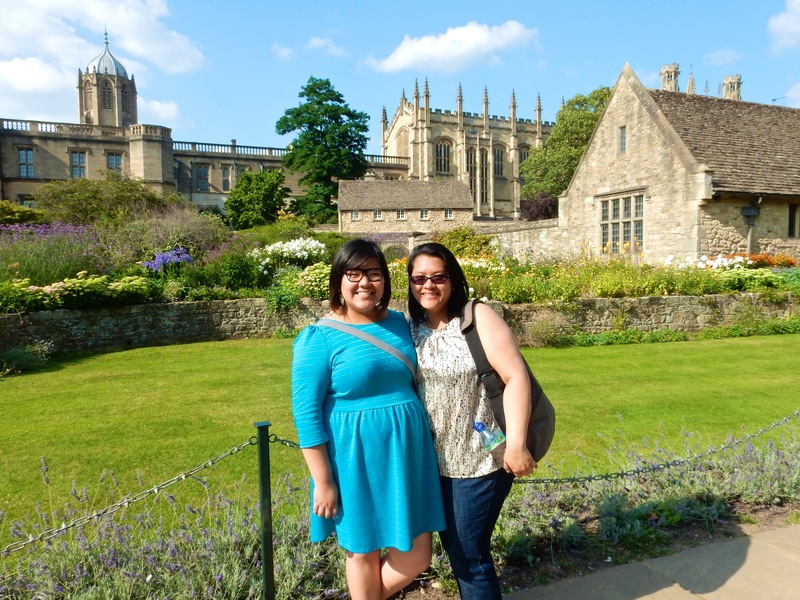 My sister and I could have just as well roamed Oxford on our own, but we wouldn’t have learned nearly as much on our own, not to mention the fact that we wouldn’t have been able to get into half the spaces we visited without him! If you have special interests in Oxford, hiring OCW is a deal that can’t be beat. 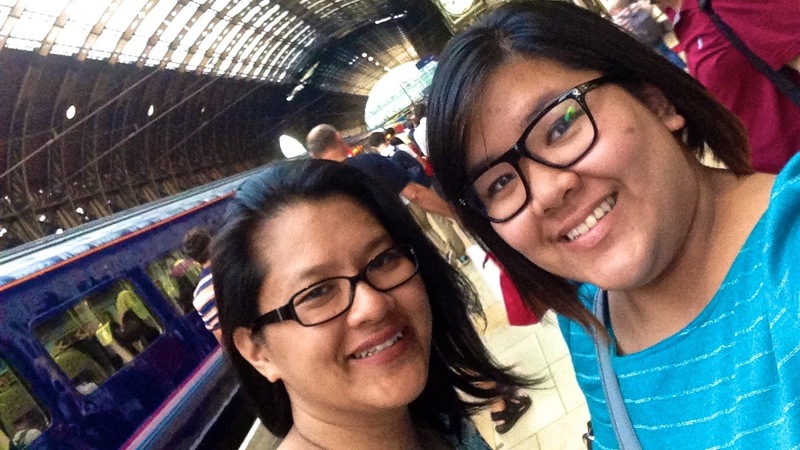 After going back and forth several times with the lovely Laura by email, we fine-tuned our interests and itinerary to focus on as much history as possible, and specifically Tolkien, his work, and his life in Oxford (as well as other literary connections, like C.S. Lewis). David was so dapperly dressed – an immediate great first impression – and his sense of humour, eagerness, and clear passion and knowledge for Oxford and for sharing it with others came through immediately. This all set the tone for what became an unforgettable afternoon. Our first stop was St. John’s College, not far from The Eagle & Child at all (in fact, St. John’s owns The Eagle & Child, along with The Lamb & Flag, another pub found opposite along the same road). 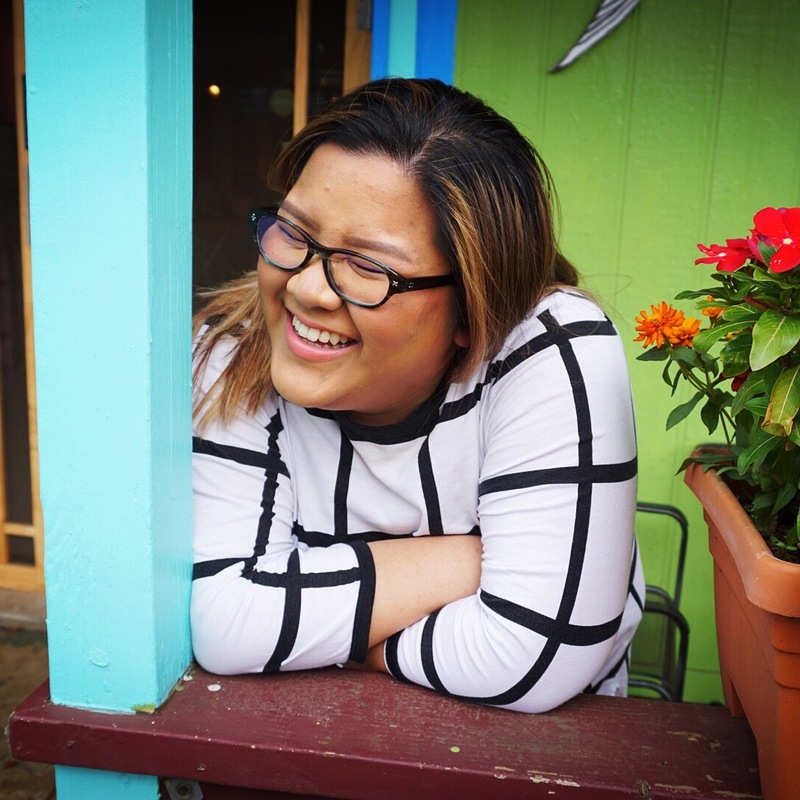 As soon as we stepped inside the college walls, the hustle and bustle of the busy streets outside faded away, and we were left in calm and quiet in the Quad. 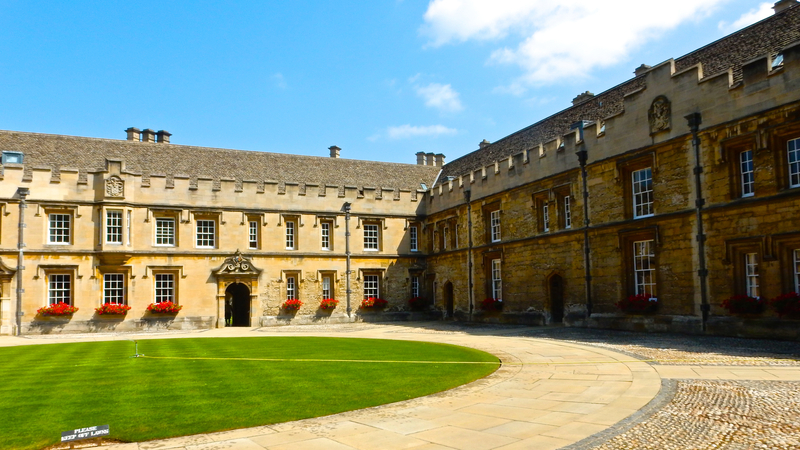 It’s fascinating how you could really see that each college is essentially a little fortification of its own; we had to pass through a secure gate to get onto the college grounds, all contained within high, thick walls. 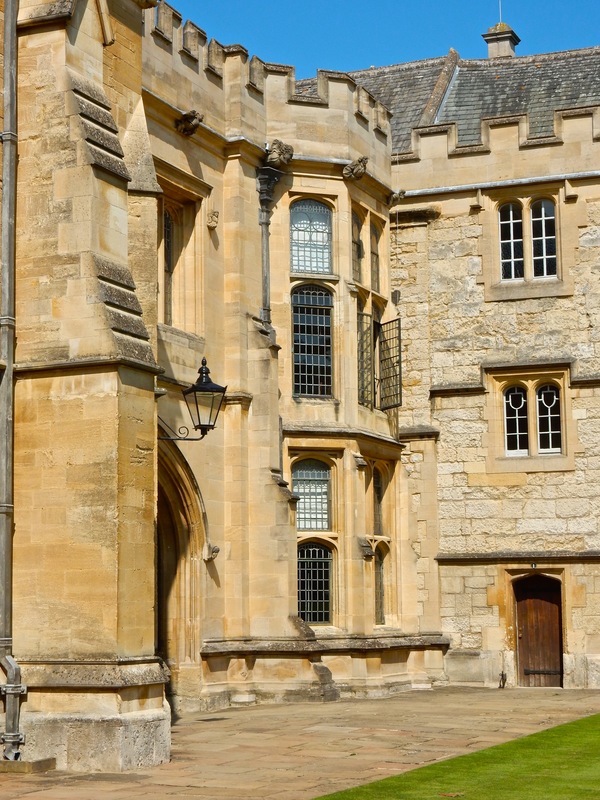 At the time these colleges were built, imagine how imposing these halls of academia bore down upon the rest of the town, in their Tudor wood homes. You can therefore imagine, too, how disgruntled townsfolk became with some of these uppity students at the time; based on the stories I heard of uprising and riot, those living within these walls ought to be thankful for them. I mean, imagine – some scholars were executed in 1209, and what happened? 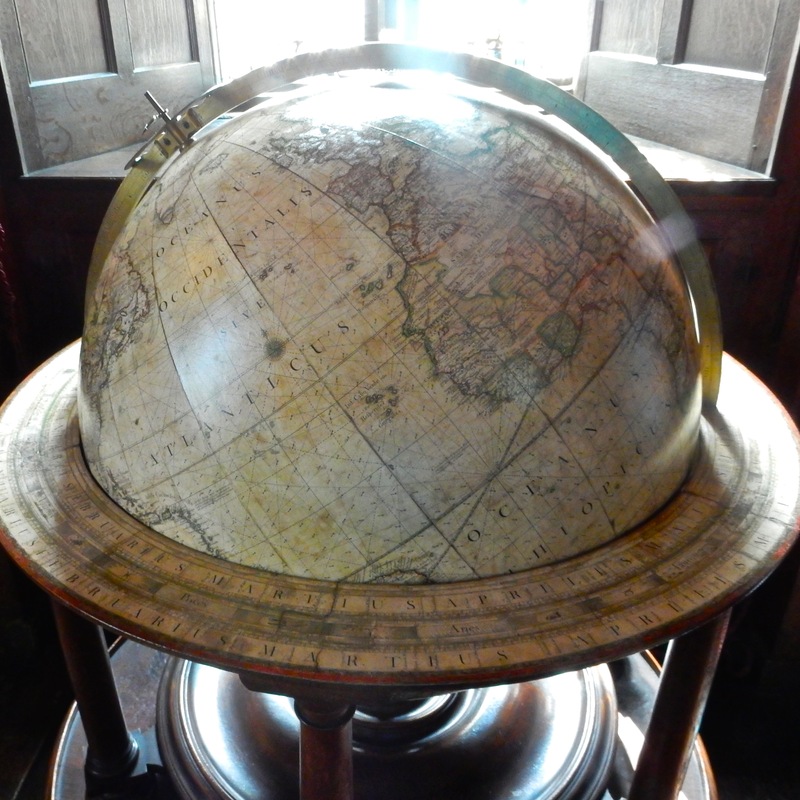 Several scholars left Oxford and established Cambridge! Seriously! If things were that serious, no wonder they needed thick walls! We paid a visit to the college’s glorious chapel, and I was so entirely distracted by its beauty and David’s enchanting storytelling that I was entirely remiss in taking photos of it! 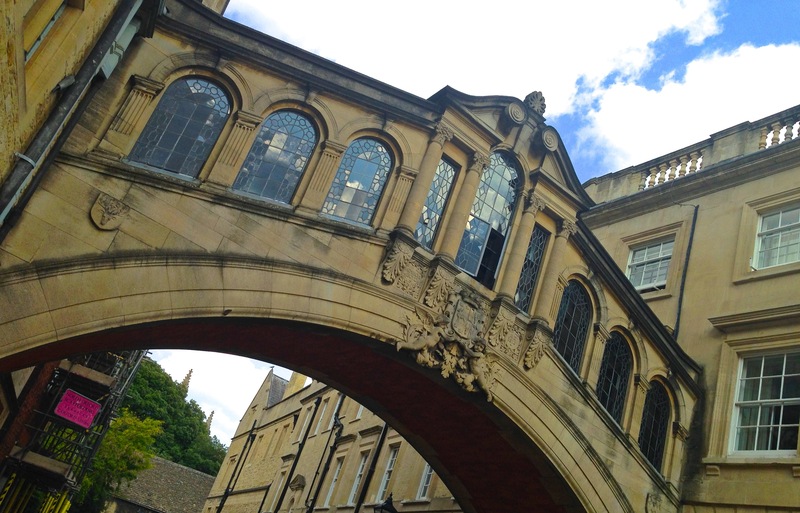 Let me just say – it explains entirely how and why St. John’s is the richest constituent college of Oxford. The grandeur and opulence of the chapel all offered up in celebration of the Lord was most awe inspiring. 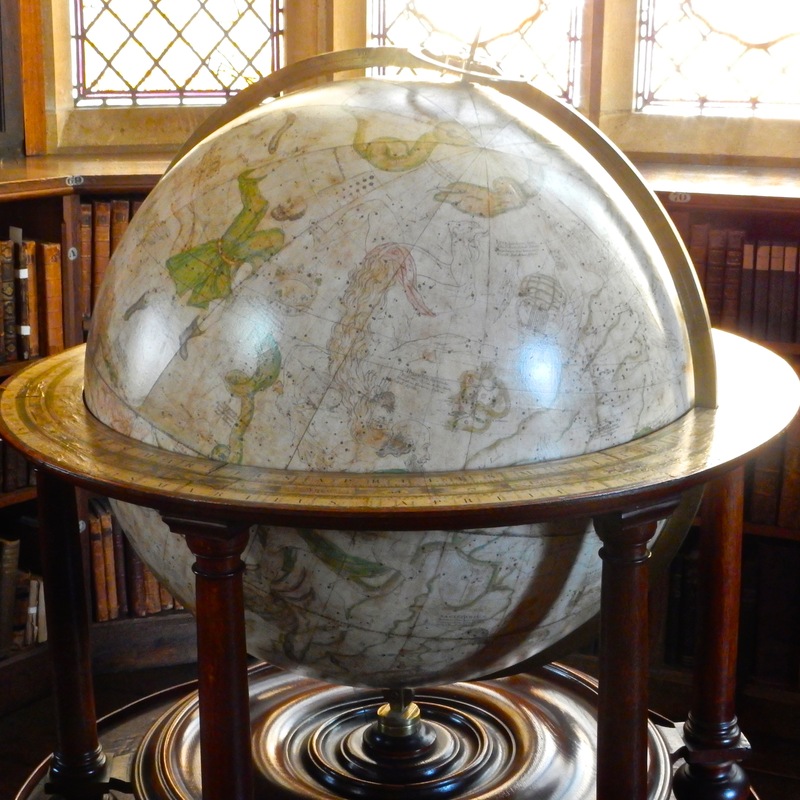 We visited St. John’s College’s library next – a wonderful treat, as outsiders like me would not typically be allowed up there! It truly felt like walking into a time machine – complete with the hazy mist that floated over us near the ceiling. 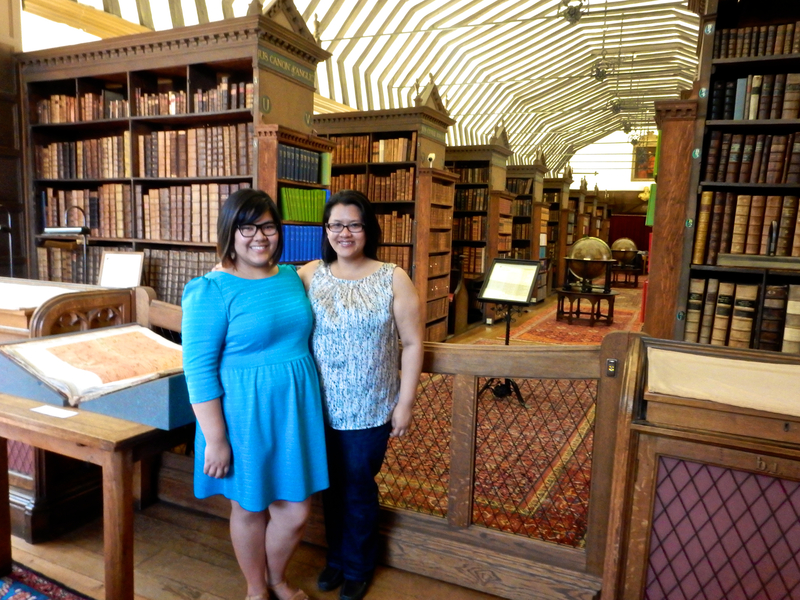 Row upon row, shelf upon shelf, we were surrounded by books hundreds of years older than we were. The floor at our feet was so delicate (original wood!) 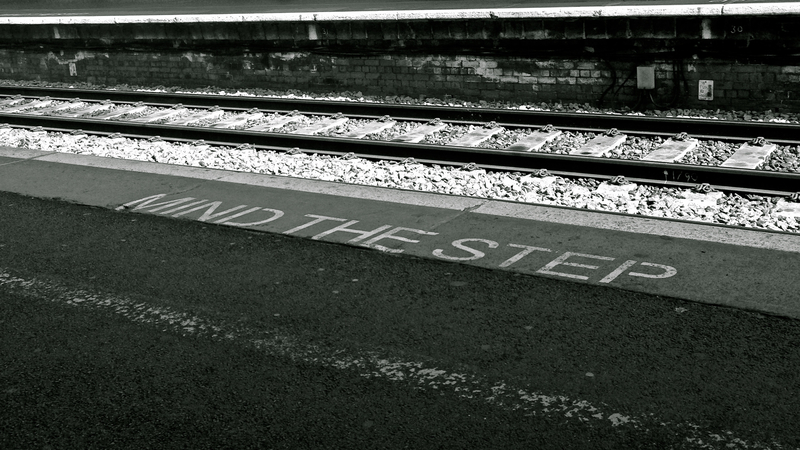 that signs were laid out pointing out that those in stilettos were not allowed to tread upon them! 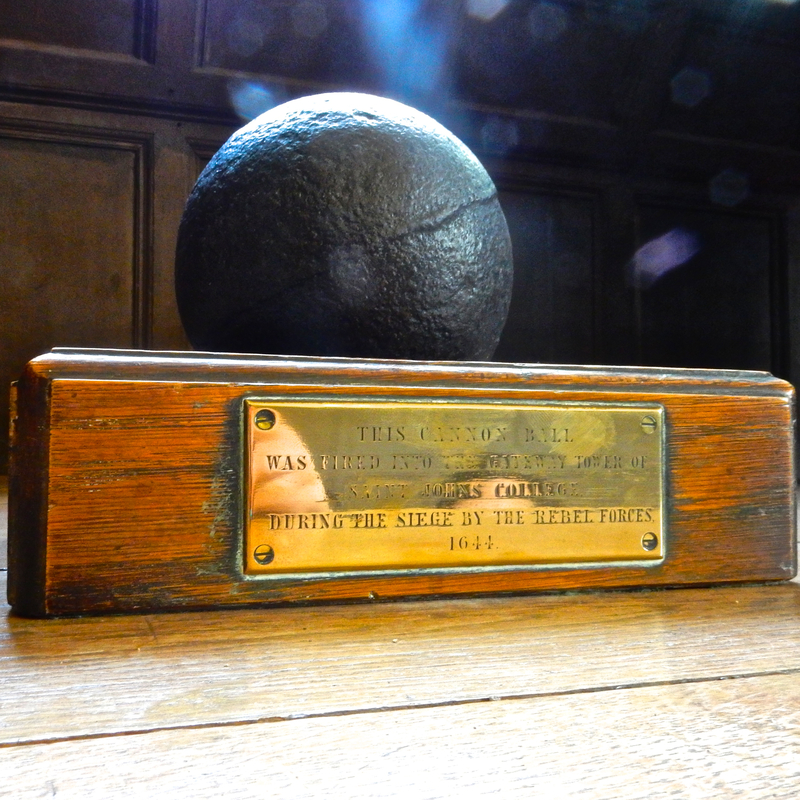 There were several objects of note in the library, one of which was this cannonball that was recovered after it had been fired into the gateway tower of the college back in 1644! Who would ever wish to fire cannons upon a college, God knows, but they have record of it and this serves as an eerie remembrance of it taking place. After we left St. John’s, we walked the streets of Oxford, learning more about seemingly innocent buildings (and naughty street names!) than we could have ever on our own without David with us. One such stop was this doorway we walked by. What’s that – a lion engraved on the door. And those two gold-gilded ornamental carvings… those look awfully like fauns. 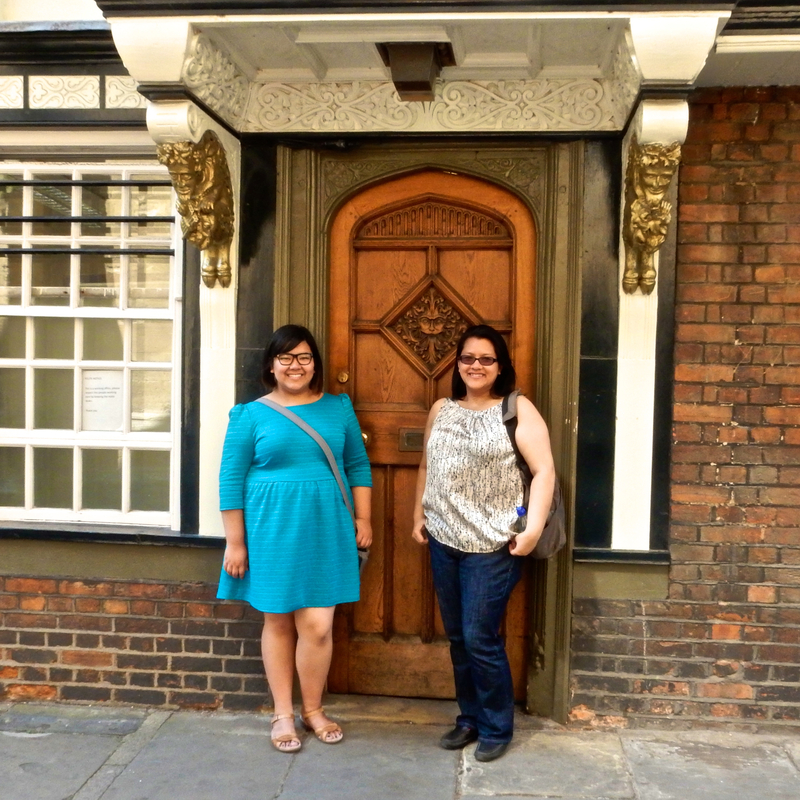 The thing is, according to David, this door pre-dates The Chronicles of Narnia, so I couldn’t help but wonder… did C.S. Lewis walk by this street every so often, pausing to look and triggering his imagination? Hmm. From here, we made our way to the personal highlight of my entire day in Oxford. This deserves a brief bit of history. 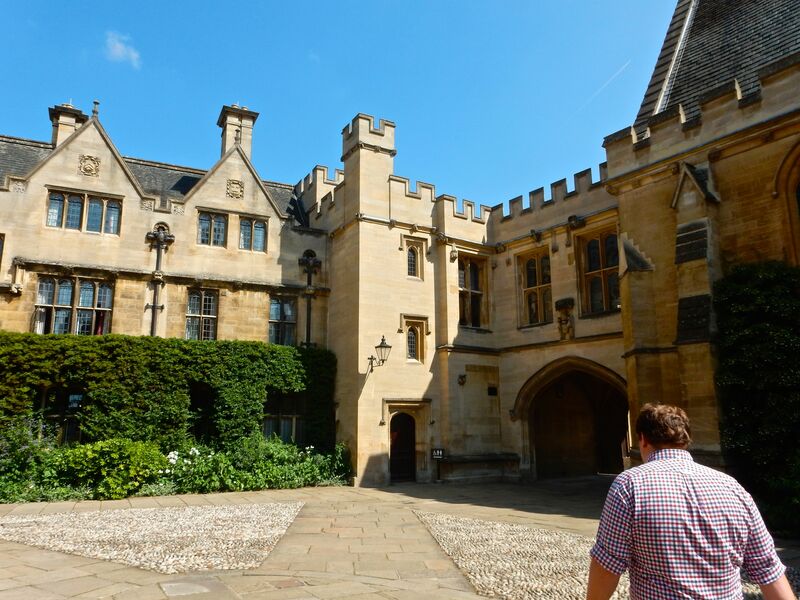 From the get go, when I’d booked with OCW, I had told Laura that if there was one college I could see, I absolutely truly and deeply wanted and needed to see Merton College. Why Merton, you ask? Well, that would be because J.R.R. Tolkien was the Merton Professor of English Language & Literature for fourteen years. 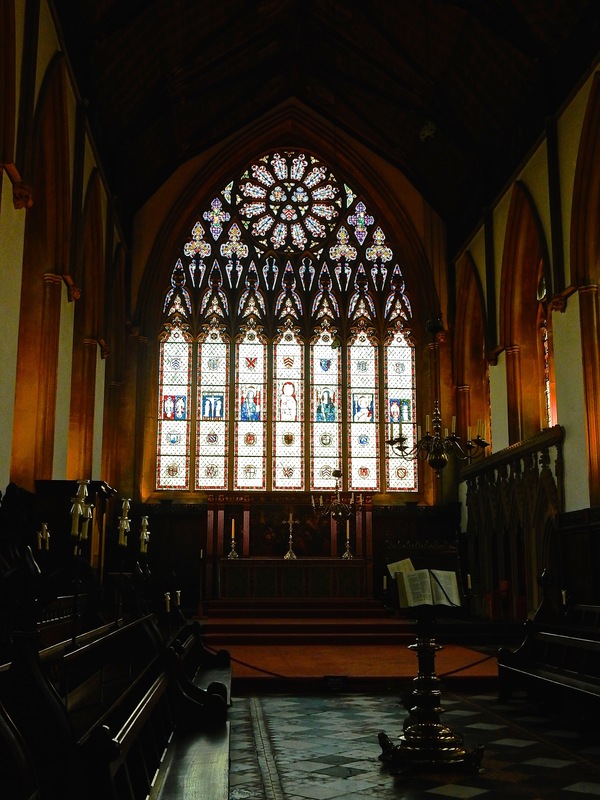 It took Laura much time and exponential amounts of patience as I prayed (and hoped and begged)… and finally, not long before my trip was due, she informed me that we were to be granted a tour of Merton. No words can express how grateful I am that she never gave up on fulfilling this request for me. 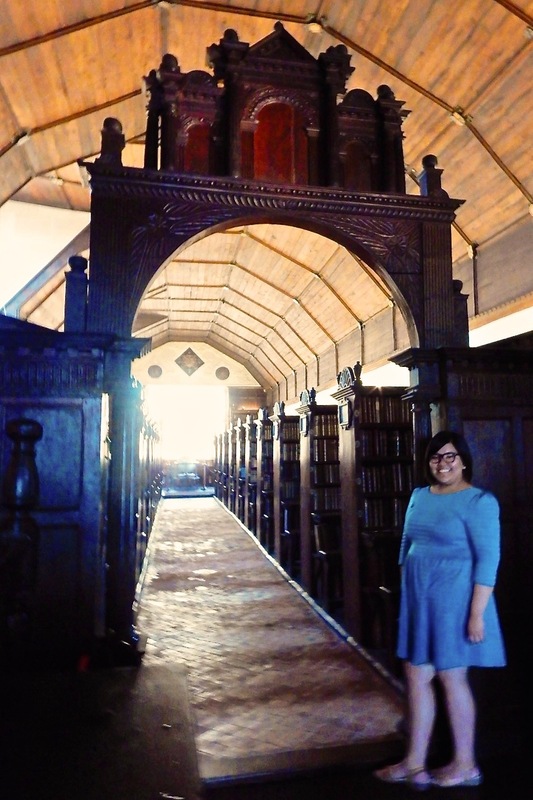 From here, Tristan led us through a heavy door and up some very old, creaky stairs, and I found myself transported to the oldest academic library in the world still in daily use, dating back to 1373. 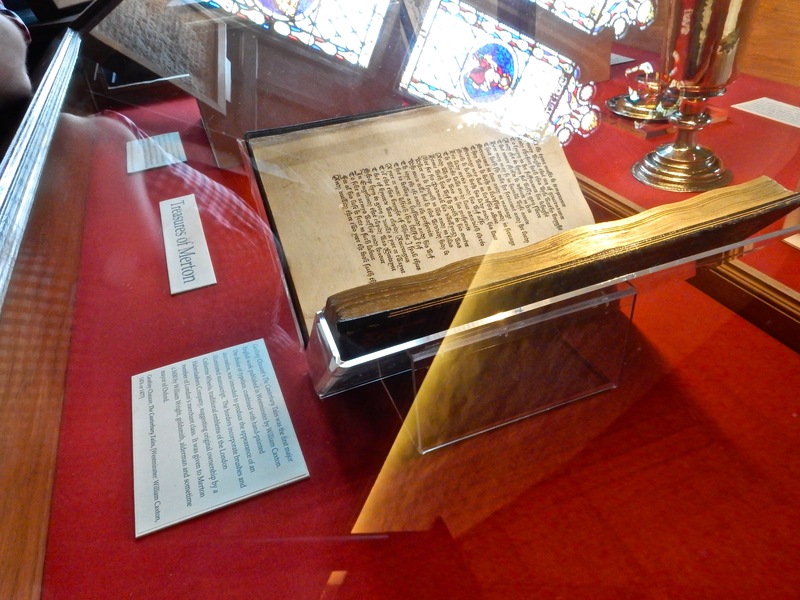 Whilst standing inside the library, Tristan showed us some extremely old tomes, whose print detail astounded me for their age (equally amazing – how “scrap paper” – that is, loose manuscripts hundreds of years older – was used in binding the books to protect the newer prints). 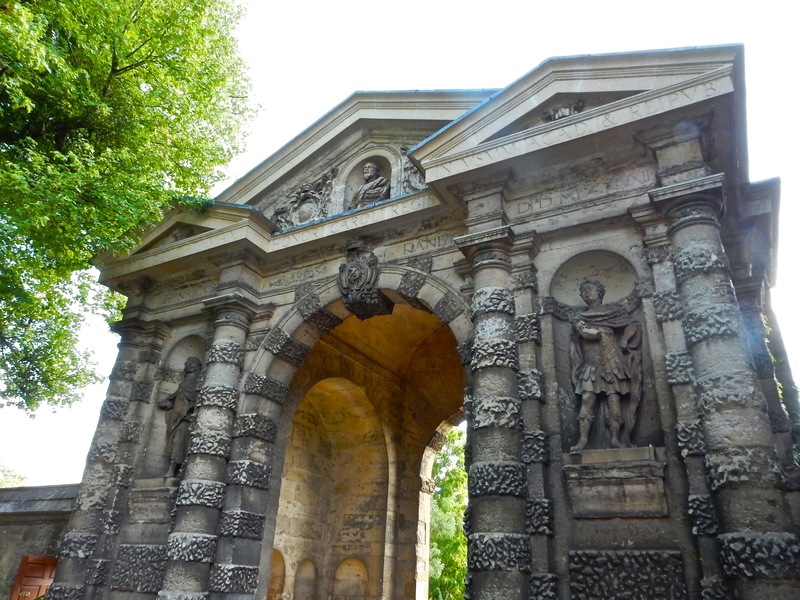 Alas, it was here, a stone’s throw away from Hertford Bridge, that we parted ways with our amazing guide David. Our day in Oxford was made amazing by his narration and enthusiasm, and I know that we barely scratched Oxford’s surface! 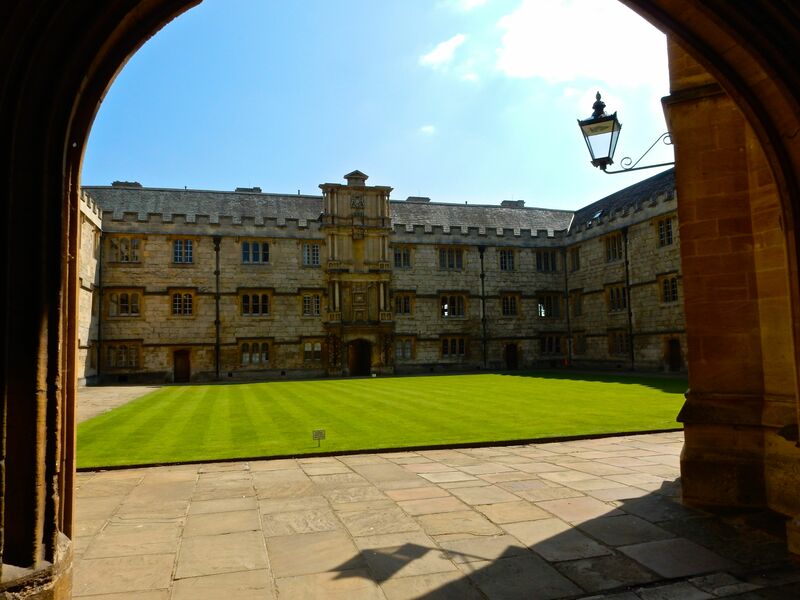 Upon my next England visit, I’ll certainly give Oxford another day or two at least… and I know I will contact David and OCW again to guide me through the cobbled streets. If you’re ever planning a visit to Oxford, please, please, please do avail of Oxford City Walk’s services. 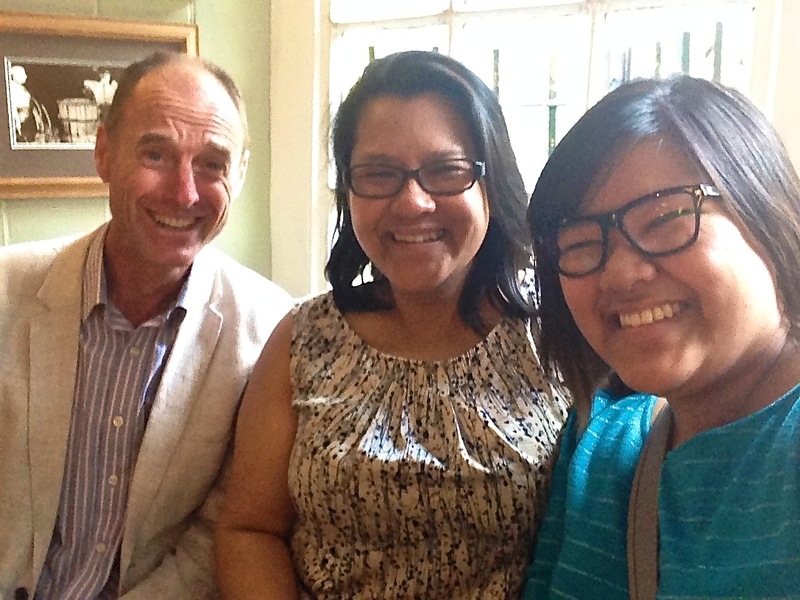 David and his team are all amazing, skillful, and eager to share this beautiful city’s history to everyone – whether you’re a Tolkien keener like me, a fan of architecture or faith, or even a die-hard Potterhead! Every tour is tailored to the guest, so everything you visit is what you want to see. David kept the tour’s pace going, always checking on us if we needed a break or change of pace, and his anecdotes, stories, and narrative was filled with history, information, and best of all, humour. There was the perfect balance of earnestness and levity in how he imparted his narration, and not once did I ever feel bored or disinterested. I could and would gladly walk through Oxford for days on end with David, picking his brain for more!